Toy News International is reporting tonight on a new trade paperback that will collect the three issues that comprised the original TMNT comic book mini-series from Archie comics. The trade, featuring early Turtles work by TMNT master artist Michael Dooney, also features a brand new cover by Dooney. And, most impressively, the interior will be published in full color! Look for it at your local comic shop around May 13. Or - best news in a long time - pre-order it now on Amazon.com!! Thanks to Ectocooler for finding the link at TNI! The End of "Tales of the TMNT"? It has been made widely known that the Tales of the TMNT comic book title exists on the whim of Peter Laird, who has continued to publish the book, for the most part out of his own pocket, even though it doesn't sell enough copies to support itself. As such, TMNT fans head toward each new year wondering if Tales will still be around. As of right now, there is no confirmation for Tales' existence--or non-existence--in 2010; however, it seems that Diamond Comic Distributors may have made that decision for Mirage already. Newsarama is reporting today that Diamond has raised its purchase order minimum from $1,500 to $2,500. This means that in order for Diamond to list and distribute a title, it would need to generate $2,500 of revenue for Diamond (not total). The break down of this is basically that "a typical $3.00 comic would have to sell over 2,100 copies to meet the benchmark." Tales currently sells for $3.25/book. The most recent sales data available, for November 2008, lists estimated sales of 2,381 for Tales. In comparison, the January 2008 estimated sales were 2,684. In the months in between, at least the ones where Tales was ranked in the top 300, a steady decline in sales can be seen. Thus, it can be concluded that Tales hangs dangerously close to being below Diamond's newly required threshold. Find different means of distribution. Some titles are likely to move to Web-only, but as we've seen with TMNT Vol. 4, TMNT fans want their Turtles on paper, making that an unlikely option for Mirage. It appears that this new change is immediate, although a grace period to allow publishers to achieve the newly required numbers is likely. This will make it extremely difficult for Tales to even get to the end of 2009, and, given Mirage's publishing history, makes cancelation come 2010 nearly certain. That said, nothing is set in stone. And if you don't pick it up already, now is the time to go to your comic book shop and let them know that you want Tales of the TMNT! It's been a long while since I've found any TMNT goodies at the dollar store, not to mention something actually worth purchasing. So imagine my surprise today as I'm wandering through and find a stack of these 2K3 kids' plates featuring the fantastic artwork of the one and only Michael Dooney. Jim Lawson updated his blog today with a new piece of art featuring all four Turtles looking down on New York from one of its many rooftops. This fantastic piece was done for a TMNT 25th anniversary project that 4Kids is working on. Jim and all of the Mirage artists were asked to contribute pieces of art; however, Mirage got these pieces of art as freebies and did not pay the artists for the time and talent put into them. Needless to say, this is unacceptable. Unfortunately, this attitude is becoming more and more typical of Mirage, namely CEO Gary Richardson who also attempted to cancel all of the employees' life and disability insurance last week to save the company all of $9,500 a year. The only reason this didn't happen is apparently due to a technicality (not a sudden change of heart from Mr. Richardson). With all of the writing that has been put on the wall concerning Richardson, the only question that can be asked is: Why does Peter Laird apparently sit back and do nothing while Mirage crashes and burns and his employees, who have given the last 20+ years of their lives to the company, as well as their entire professional careers, struggle to make ends meet while he and Gary Richardson are living free and easy? You can see the new piece by Lawson in full here. Addendum: It has been clarified to me that 4Kids, not Mirage, requested these pieces of art and as such, it was 4Kids, not Mirage, who did not pay for them. It still seems to me that Mirage could have found it in their hearts to pay the artists for the pieces anyways, and asking for art that you don't intend to pay for, no matter who the asking party is, is in poor taste no matter what the situation. Today, Comic-Con International released the themes and anniversaries it will recognize and celebrate at this year's event in San Diego, July 23-26. 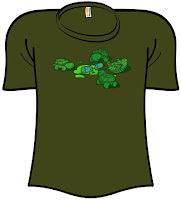 And yes, the 25th anniversary of the TMNT is among the celebrations! For information on how to submit art and/or articles for consideration for this year's souvenir book, click here. Now that's some Turtle Power! The Nuart Theater in LA will be screening the original Teenage Mutant Ninja Turtles movie Friday, January 23 at midnight (Saturday morning). Thanks to Archon_Turtle for the heads-up! Shirt.Woot.com is currently selling the fantastic T-shirt at left. The original run, priced at just $10, sold out in just over two hours (check out all of the impressive sales stats!). The shirt is now available for a still-reasonable $15, and with the option of free shipping is still cheaper than anything at Hot Topic. While this is currently in no danger of selling out (again), it will only be available for a limited time, so it's in your best interest to order one ASAP! Thanks to Cherubae for giving me the initial heads-up! Savvy TMNT fans were watching TMNT25.com on January 1, when the site relaunched itself with loads of new content. However, and rather sadly, the content on the site is poorly written, features bad grammar and punctuation, and, most unbelievably, is full of inaccurate information. If the TMNT25 team doesn't believe in the use of editors or fact checkers, that's their choice to poorly represent the TMNT brand. As easily as I could, I'm not going to tear apart the site to show off its poor use of design, poor writing, inaccuracies, etc. However, there is one page so greatly misleading that I cannot ignore it. You would think the "About Mirage Studios" page would be the easiest page for the TMNT25 team to write. But it only took a quick glance for me to find glaring errors. As such, I did a bit of digging into my personal TMNT archive to find references and do some fact checking. The result is what you find below. I realize that this is a lot more depth than the "About Mirage Studios" page was intended to have, but if you compare the two you'll see the conflict in information, especially with certain dates. Steve Lavigne, high school classmate and friend of Kevin Eastman, as well as the real-life inspiration behind Michaelangelo, was Mirage's first employee, hired in 1985 to help with lettering duties beginning with issue #5 of the original TMNT comic book. His duties would expand to coloring comics and art and penciling licensing art that was used on thousands of TMNT products sold around the world. Lavigne left the studio in 1995 to return to his home state of Maine. He still does occasional freelance work for Mirage when asked. After giving Eastman and Laird a piece of fan art at a comic convention in Detroit in 1985, Ryan Brown was asked to "get in touch" with the studio in the letters column of the 4th reprinting of TMNT #1, published in September 1985. He did so immediately, resulting in an inking tryout for a short comic titled "New York Ninja" that would later see print in the back of the TMNT RPG supplement book titled Teenage Mutant Ninja Turtles Adventures! Passing that test, Brown was then invited to join the studio, making the move to Northampton, MA in September 1986. He would eventually use his inking skills on most of the licensing art drawn by Lavigne, as well as some comic covers. A life-long love of toys made him a perfect match for the role of the in-studio Toy Coordinator after Playmates launched its line of highly successful TMNT toys and action figures. Brown left the studio in 1995 to return to his home state of Ohio. He still does occasional freelance work for Mirage when asked. Around the same time Brown set foot in Massachusetts and after a successful portfolio presentation, Jim Lawson was invited to move up from his home in Connecticut to join Mirage. Lawson and Brown then teamed together to draw and ink, respectively, a new companion comic title, Tales of the Teenage Mutant Ninja Turtles. 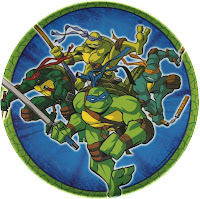 Lawson would also contribute to licensing art and penciling of the regular TMNT comic book series, becoming the main penciler starting with issue #48 of original series, a role that he maintains today with Volume 4 of the series. Michael Dooney wrote a fan letter to Eastman and Laird after the original publication of the very first TMNT comic book. Dooney, an inspiring comic book creator in his own right, kept in touch with Mirage and would pencil issue #9 of the comic book, released in September 1986, while still living in New Jersey. After moving to the studio full-time, Dooney contributed art to more issues of the original comic book, full-color paintings for the official TMNT magazine, and some of the early issues of the Archie comics TMNT series among other things. Dooney remains with the studio today, contributing art for licensing, comic books, and toy design in collaboration with Playmates Toys. In mid-1989, after the first few issues of the Archie comic series, Teenage Mutant Ninja Turtles Adventures, which were simply adaptations of the TMNT cartoon series, the book was horribly late and in danger of breach of contract. Seeing an opportunity, Brown asked his friend and roommate, Steve Murphy, to collaborate with him to create original stories for the comic series. Murphy, who was writing his own comic series, The Puma Blues, and doing proofreading and editing for Mirage, was hesitant to commit to the project, but finally agreed to take on the writing duties under the pen name Dean Clarrain. Murphy left Mirage with the end of the Adventures series in 1995, but would return in January 2002 as Creative Director of Licensing and Managing Editor of Tales of the TMNT Volume 2 when the title was established January 2004. Murphy resigned from his duties as Managing Editor in August 2007, but remains in the position of Creative Director of Licensing. With Adventures back on track, Brown and Murphy needed a permanent inker for the book. Brown contacted his old roommate in Ohio, who had just graduated from art school, and asked him to join the team. 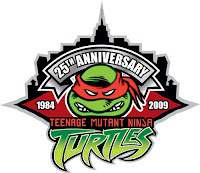 Dan Berger came to Massachusetts in August 1989; his first Turtles work was TMNT Adventures #8, published in February 1990. He has also contributed to the original TMNT comic book, licensing art, and the daily TMNT newspaper comic strip. Berger has been the Webmaster of ninjaturtles.com since 1998 and Managing Editor of Tales of the TMNT Volume 2 since Murphy's resignation in 2007. Like Lavigne, Eric Talbot was a high school buddy of Kevin Eastman. His first work with the TMNT came with issue #17 of the original TMNT comic book, published November 1988. He would continue to contribute to TMNT comics and various licensing endeavors throughout the duration of the TMNT's popularity in the 90s and continues working with Mirage to this day. Riding on the success of the TMNT, Kevin Eastman bought Heavy Metal magazine in 1991. His last TMNT work was the comic Bodycount, published by Image in 1996. In 2000 he sold the creative rights of the TMNT to Laird so that he could focus completely on Heavy Metal. However, this separation was not the end of his involvement with the TMNT. In 2002 he published his TMNT "Artobiography" under the Heavy Metal label and in 2005 he gave Mirage the connection they needed, with Imagi Animation Studios, to make a new big-screen TMNT adventure a reality in 2007. In 2008 he sold his remaining TMNT holdings to Laird, but with plans to republish a handful of classic TMNT stories, the first of which, Bodycount, was released the same year.